The carp are so thick in one of our restored creeks near the Platte that their top fins stick out of the water like a shark’s and you can see small schools of their long bodies grubbing around nose-down in the shallows. Fish over a foot long fling themselves into the air above the creek’s slow pools when they’re spooked, seemingly at random. I noticed this abundance on my first day out on the prairie with Chris. With his blessing, it became my mission to harvest a quantity of this invasive fish-flesh in our stretch of creek near the crew quarters. My fishing spot. Photo by Anne Stine. I found a beautiful fishing spot on a bridge over the pinch between two large pools. From the bridge, you could see carp and gar loitering below. 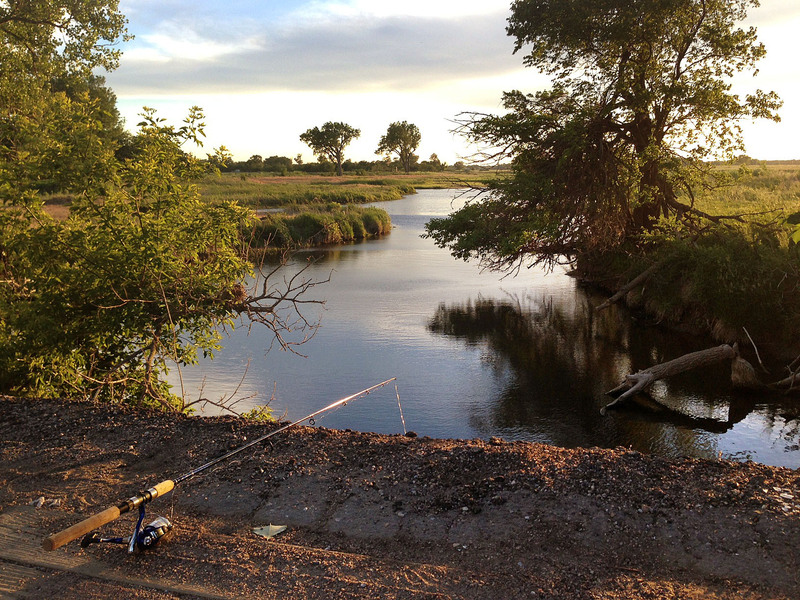 The view of our pastures to the west of the bridge promised a lovely sunset for an evening angler. I baited my hook with corn kernels and cast it in. Less than ten minutes later I’d hooked a carp as long and meaty as my forearm. Supposedly tricky to catch, these trash fish do love corn. The carp pulled and struggled while I attempted to tire the fish before hauling it in. I was wary- I’ve snapped lines before by reeling in too soon. One fish had gotten away after breaking my line above the bobber. I watched him tow my bobber around and continue to forage for the rest of an evening, the red bobber dragging behind him like a balloon on a string. 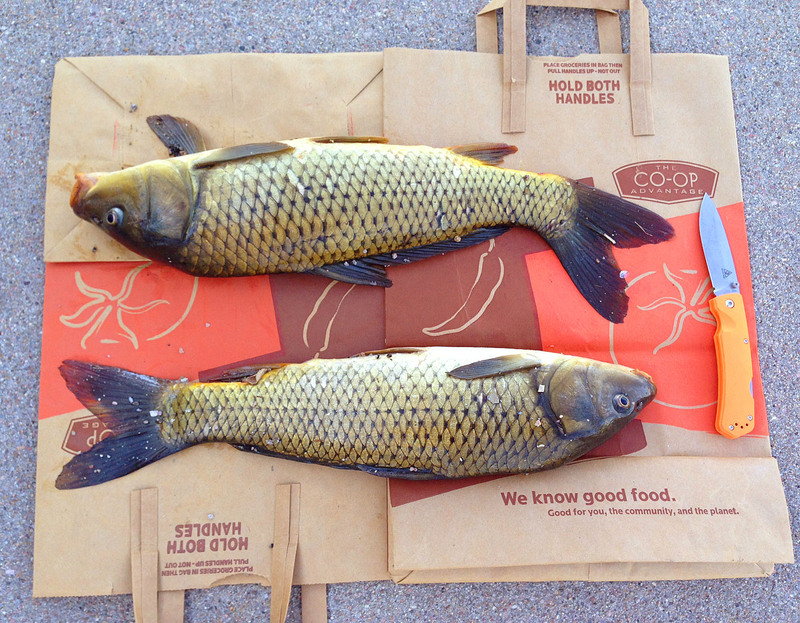 Carp are an invasive species for much of the United States. They are considered problematic because they become over-abundant and eat food used by native fish, and their foraging method stirs up mud and increases turbidity in the creeks, rivers, and ponds where they are established. It used to be illegal to throw them back in Minnesota. Nebraska and Iowa still host a “Carp-O-Rama” bowfishing tournament, with prizes awarded based on the highest total weight and the highest total number caught. Carp’s bad reputation is bolstered by its arguably inferior flavor. Carp are generally considered trash fish because they can have an earthy taste partially sourced in a ‘mud vein’ running along their sides. They also have a complex bone structure that makes filleting a challenge. Common recommendations for preparing carp fillets include scoring the fillets in the diagonal strips so the small bones are softened enough to eat with ease. Smoking carp is also frequently recommended for the same reason. Naturally, I didn’t read any of this and assumed that Americans were just being snobby by snubbing this fish that is widely eaten in Europe and Asia. After catching two moderately sized carp, I went home to fillet the fish and fried them up for my coworkers. Dinner! Photo by Anne Stine. I want to say the carp were delicious. I want to say “Everyone! Go out and help yourself to amazing, readily available fish. Do your river a favor and eat carp.” Frankly, carp is bony with a muddy aftertaste. I’ll try a few more prep methods, but my enthusiasm for utilizing this neglected resource is greatly diminished now that I’ve had it. Hopefully bunnies this fall will be easier on the palate. This entry was posted in General and tagged angler, anne stine, carp, cooking carp, fishing, hubbard fellowship, nebraska, platte river, platte river prairies, the nature conservancy by Chris Helzer. Bookmark the permalink. Between carp and bunnies, try bullheads from a local farm pond that still has water…. Years ago when I was still canning food, friends brought me a huge tank of carp they had just caught. I decided to try canning them like I did beef. Place in the quart jar, add 1 tsp of canning salt and pressure cook them. I don’t remember who long, probably just like beef, and when eaten they tasted just like salmon. Very good and you didn’t have to worry about the bones, as they were soft like salmon. It was worth the try. We are driving in August from home in Waco TX to Omaha and then to follow Lewis and Clark into Montana. Planning prairie stops on the way – Tallgrass Preserve in OK and KS. Looks like we will be east of what you write about. Any suggestions for prairie education, viewing etc in NE, SD and ND? We’re working on a restoration near Waco and anything we can learn will be appreciated. Many thanks. I greatly enjoy your posts and photos! Tom – others may have better suggestions for the Dakotas. In terms of seeing prairies, I’d check out Spring Creek Prairie by Lincoln if you want to go a little west. Hitchcock Nature Preserve is across the river from Omaha in Iowa. Also, if you have time to swing by Broken Kettle Grasslands in northwest Iowa, there’s a really scenic drive around the preserve and neighborhood. Have a great trip! My favorite recipe for carp is to leave the skin on the filet, marinate them in a mixture of lemon juice and barbeque sauce, cover them with tin foil, and grill them on a board over hickory charcoal (but not too hot). Then take them off the grill, let them cool for about a minute, throw the fillets away and eat the board. Ummmmm. good! They make excellent fertilizer for the garden! My Dad used to put them in a horse tank with fresh water in it for about 2 weeks to get the “earthy” taste out of them. Don’t know how they cooked them! I don’t like fish! In Hungary, I had it stewed in red wine. An invasive species, that really disturbs the water. By going down to the bottom, to tear out and eat aquatic plants. Thus muddying up the water, and disturbing the benthic life there. Just a couple of weeks ago I had smoked common carp for the first time and didn’t care for it. I’ve had smoked silver carp, though, and liked it and I’ve had pickled common carp and liked that. I would try pickling small pieces of carp. My Dad used to barbeque them in a very smoky sauce….it was good! Walleye is delicious, it is very popular in the Midwest. Carp originally came from the Aral Sea in Central Asia (which is quickly disappearing). It came to Europe, during Roman times. We had a friend who loved carp. He was Vietnamese. So, whenever we caught one, which wasn’t often, we had someone who would take them. Yay! I love fish, but not when so much work is involved. I say cut it up and feed it to turtles! How about drying them, and grinding them up for fertilizer? I have heard the native Americans would dig a hole, put in a fish, and plant maize, beans, and squash in a mound. Carp might be perfect for this! Native Americans did not have carp. Just like Native Americans did not have horses. They got horses during the 16th century C.E. I heard a presentation by Quinton Phelps, a Resource Scientist with the Missouri Department of Conservation about preparation and cooking tips for Asian carp. Here’s a link to a recipe that might be worth a try. – Stun, gill, and bleed the carp immediately upon catching. Put it on ice right away too. A long, painful death will lead to poor tasting meat. This alone should help considerably with any off flavors. – Brining the fish helps considerably as well. I did a casual, non-scientific taste test with some friends actually. The meat from a female carp was divided into three sections. One section was brined, another was brined with lemon juice added, and the last piece was just wrapped in foil and refrigerated. All were pan-fried with a bit of oil. The meat was very white. Each person tried a different preparation, picked their favorite, and gave their overall impressions at the end. No one knew they were eating carp. Everyone really liked it and said they would definitely eat it again! Based on my test, and the many accounts I’ve read of people eating carp unknowingly, I’m convinced the main issue isn’t with their flavor or bones but in the name alone, “carp”. Doing a really good job of “scoring’ carp fillets requires some skill. We scaled the fish and then filleted them, leaving the skin on and carefully scoring almost right down to the skin. If you don’t like the strong taste, cut out the dark red meat – what many call the “mud vein” .